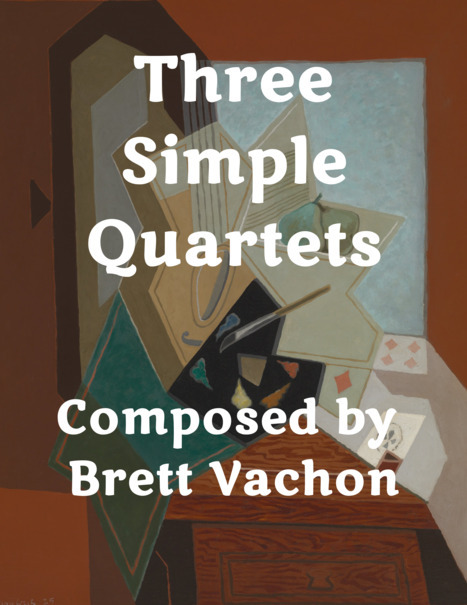 The Three Simple Quartets (en français : trois quatuors pour débutants) is a short three movement work for String Quartet written in 2008. I originally wrote the work for my Dad's beginner string group. The work was featured in a Spring Concert by the Magenta String Quartet entitled "Fresh From the Pen". The performance took place on 25 May 2013 at Eastminster United Church, in Toronto, Ontario, Canada. The first movement of the "Three Simple Quartets" was inspired by a beginner piece for Strings entitled "Space Attack" by Robert Spearing. My composition was featured on the Australian radio station 3MBS hosted by Mark Vendy. Check out the broadcast here. You can download the score on my Issuu page.